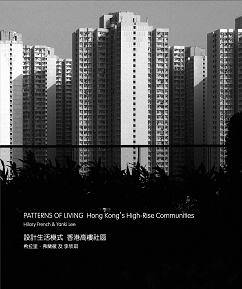 Following her publications on housing design, French was commissioned to contribute to a project coordinated by Dr Lee at Hong Kong Design Institute, a unique opportunity to gain access to the standard ‘social housing’ units designed by architects and occupied by ordinary families. Inspired by European modernism, the Hong Kong Housing Authority (HA) has pioneered land reclamation and high-rise construction, producing some of the world’s densest, most vertical residential areas built since the mid-1950s. Data were collected and analysed from 120 typical homes to discover how families occupy the compact flats that have continued to be developed, maintained and rented by HA. The research shows for the first time the interiors – the lived reality of modernism's housing project – and has highlighted a particular flat type that housing studies now categorise as ‘indeterminate’: it is offered to tenants as a shell to partition to suit their own desires. Its success offers a model with international significance, controversial especially in rental housing, but with the potential to reduce housing costs and allow future flexibility potentially a way forward in reducing housing costs and allowing future flexibility. French designed and led the overall project and contributed an essay tracing the history of the design of Hong Kong’s low cost housing from the 1950s. She developed a drawn analysis of the development of the Hong Kong standard housing types. Historical sources included the HA, Colonial Building Notes published by the Building Research Station, and other reports by the British Architects and Housing Commissioners. Dr Lee managed the data collection with student volunteers as research assistants. The resulting sketches, drawings, photographs and notes were analysed, organised and drawn to the same style for legibility and comparative purposes. French gave a paper based on this research at the Design History Society Annual Conference, ‘Towards Global Histories of Design: Postcolonial Perspectives’, National Institute of Design, Ahmedabad, India (2013).